← Don’t Pour Salt On Climate Scientists! 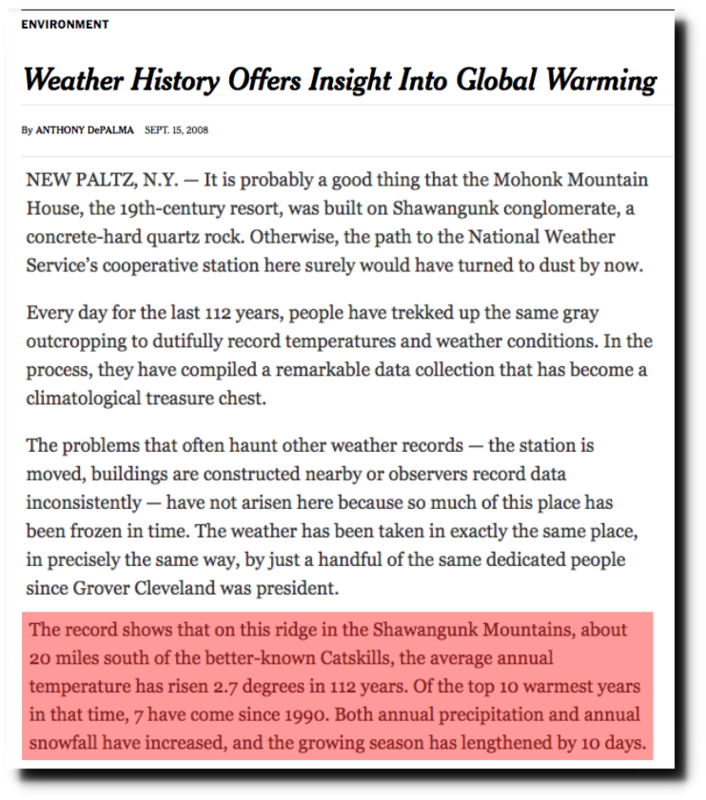 The New York Times ran this story ten years ago, using pristine data from Mohonk, NY to prove that the world was heating out of control. 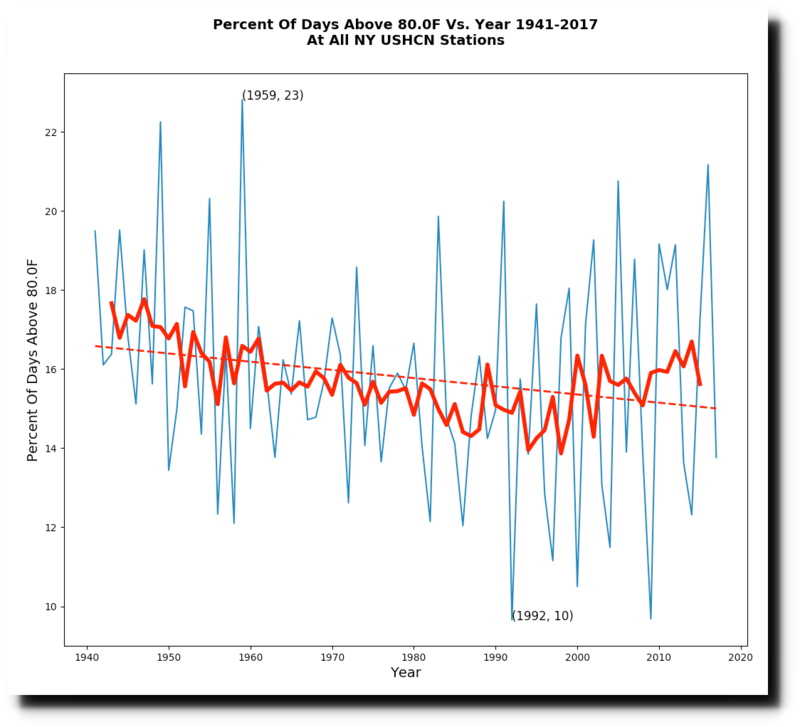 The Mohonk station shows that the world began to heat out of control after the year 1980, and that the frequency of hot days has skyrocketed. Scary stuff! 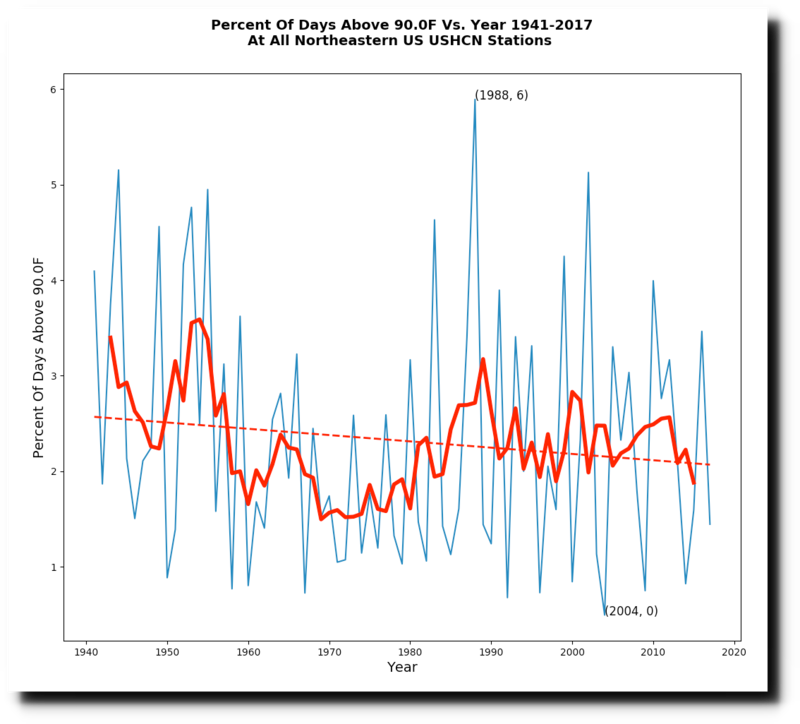 We probably need to invoke immediate world communism to stop this warming. Except for one minor problem. 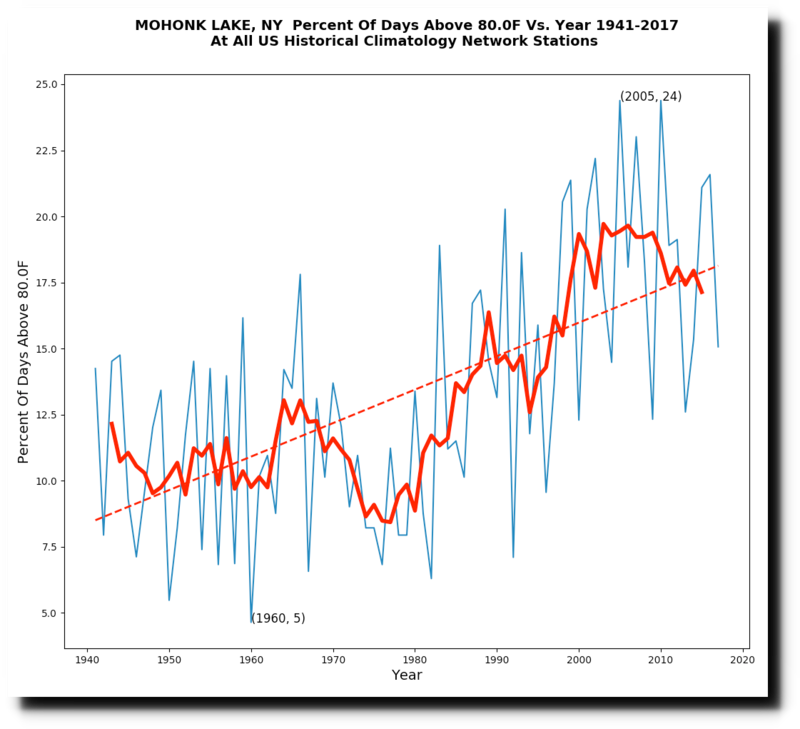 The Mohonk data doesn’t agree with the other stations in New York, which show the 1950s as the warmest decade and the frequency of hot days declining. 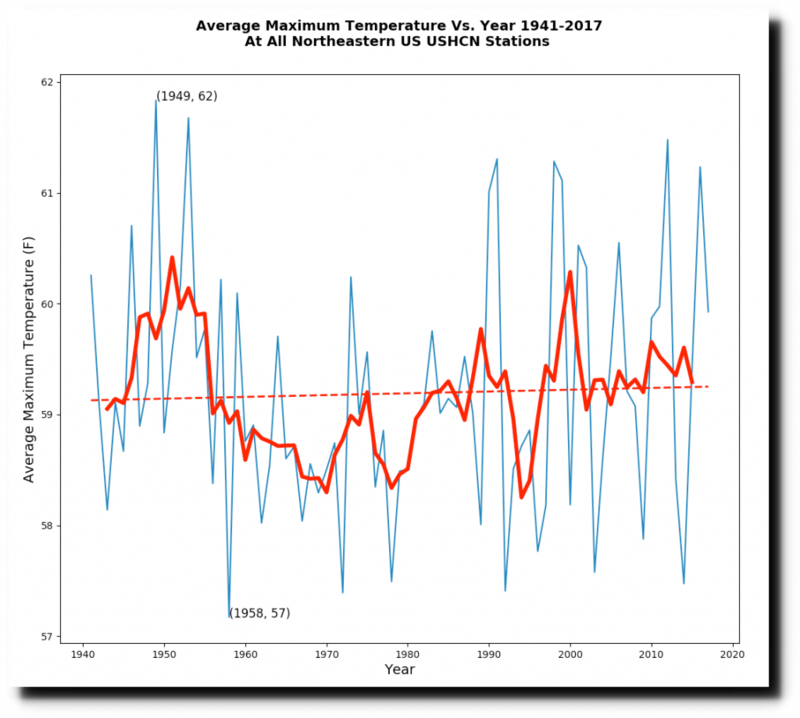 Same story for the entire Northeastern US. 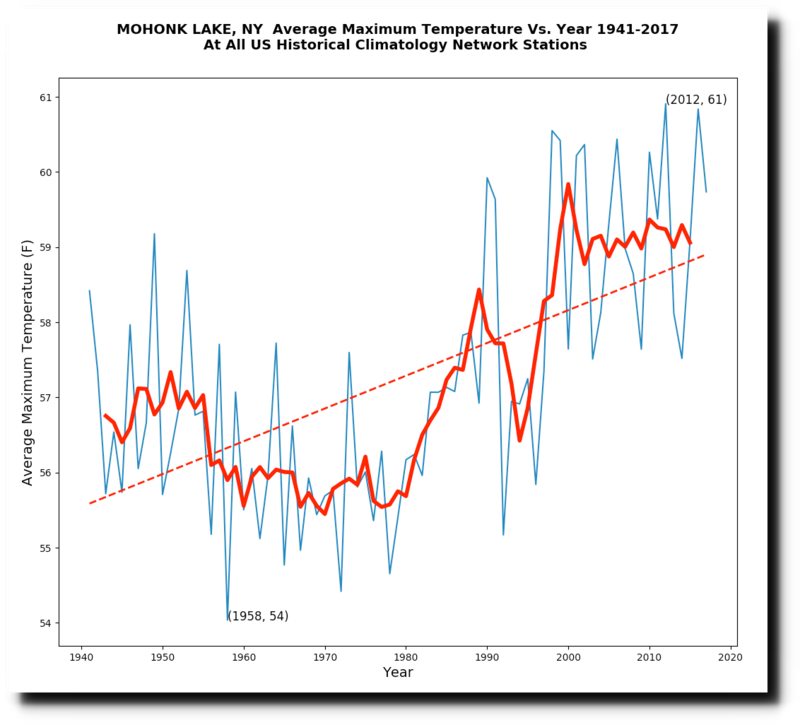 The post-1980 warming shown at Mohonk doesn’t exist, and the period around 1950 was the warmest. 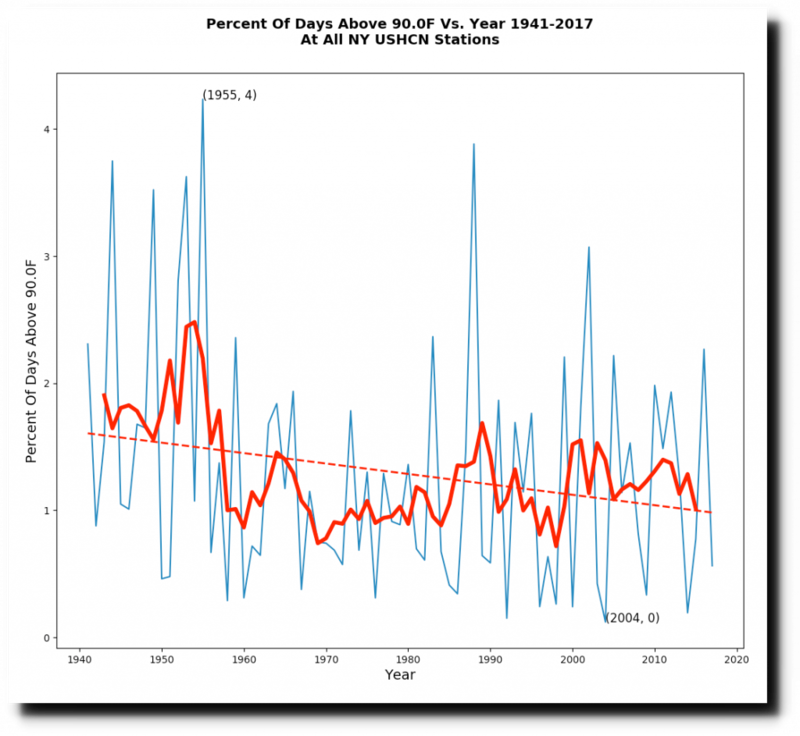 Sea level rise rates also peaked around 1950 at New York. 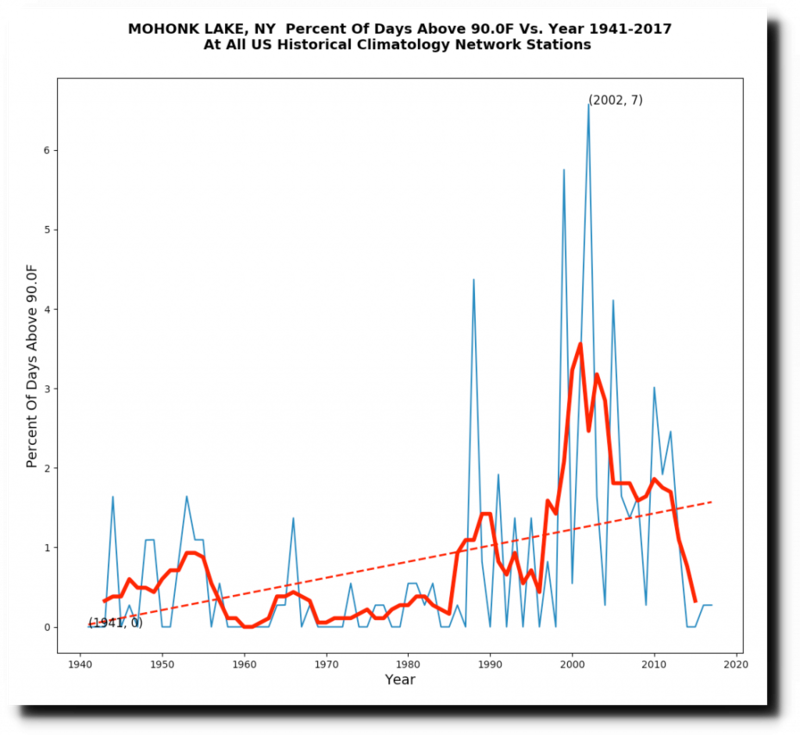 I have no idea what is wrong with the Mohonk data, but every indication is that is defective – just like New York Times reporting. Too many tourists heading up for the incredible accommodations and spectacular meals at the Mohonk Mountain house; lets cut back on human enjoyment. No more great hiking, great rock climbing, a great cycle climb to the hotel, golf too; think the average guest would be happy about that? I know the escaped urban hippies living in the surrounding towns (mostly New Paltz) and Saugherties would love it. Ive been their plenty of times, never thought to investigate the conditions surrounding the station; next time Im there I will check it out. I suspect there will be the normal site movement, enlargement of the parking lots, tree cutting for enlargement of the golf-course etc. Could be several things, UHI included, but it also could be a statistical grouping. We have a farmer that had a series of tough years, 320 acres of his land kept getting droughted when everyone around him didn’t. There are geological formations with rivers bluffs etc… that can cause this and pieces of land become near impossible to farm in areas where no irrigation is ever necessary, but his land wasn’t that way. He finally sold the land to neighbors and it took a couple of years, but the dry spell left. Statistically a fluke, but there is a lot of dice rolling and sometimes one areas gets repeated result randomly. In this case, perhaps a few years of warm spells. hence the reason to look to larger areas and trends. I looked up the site and then accessed the metadata. In about 1990 the station swothed to a fully electronic remote monitoring system from Cambell scientific. The newspaper stuff about people trekking up,to take manual readings has been a lie for almost 30 years. Experiments in Germany and Australia show electronic systems read hotter than lig systems because they react to transients while LIG thermometers don’t. 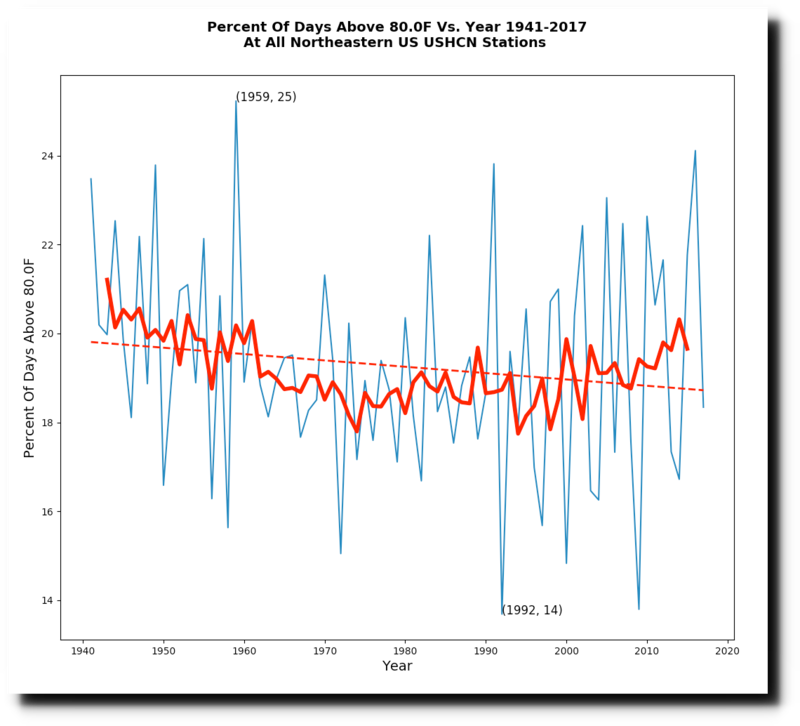 The whole difference cted is likely due to the unreported (worse, deliberately misled) instrumnet shift. So they still have to adjust (up) the data. As goes Mohonk so goes the world. Truth! I blame scoopable cat litter! I’m sure (without actually looking) that the scoopable cat litter usage hockey stick mirrors Mann’s hockey stick. Tex, you are correct, but first you must scoop out and dispose of the non-temperature-sensitive cat litter. How can you tell? Well, it’s very scientific. First, you run all of it through a machine you borrowed (you don’t have your grant yet) from the Geology department. It measures something (not sure what-those dirt people tried to explain it but they just talk in gibberish! ), but when you chart the results you can see some lines go straight across and then shoot upward toward the end. That’s now known as “the data”. 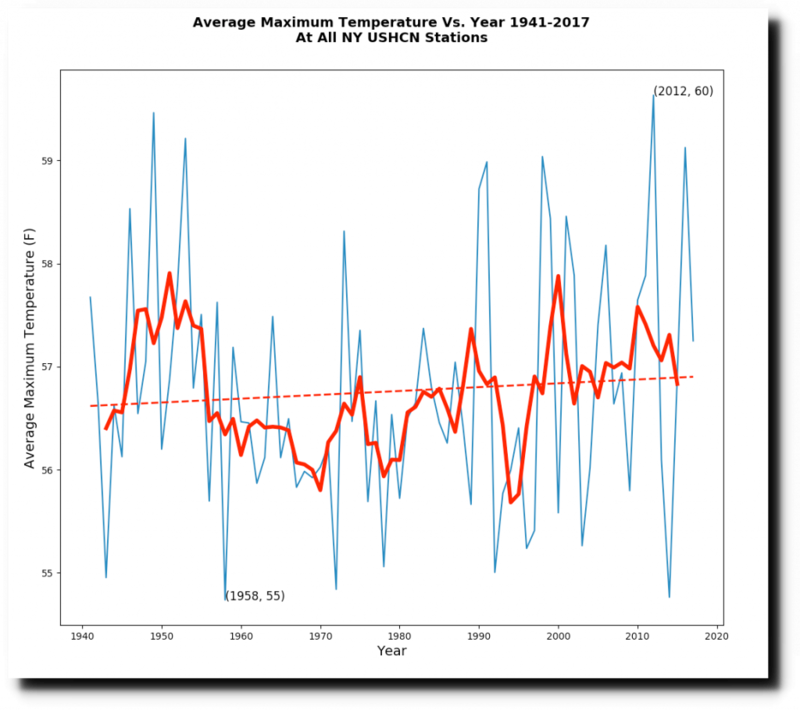 All the rest is not temp sensitive, and you can dispose of the litter and the charts and tell nobody about that part, it’ll just cause a lot of denial. Easy peasey. They may still have had the old stevenson in 2009, but it is for sure not used now. Tony – Cherry blossoms pushed back to April 8-12 due to abnormal AGW! How revealing! I gather that phenology is to Ecological National Socialism as phrenology is to its predecessor version of German National Socialism. The ability to see data where none exist has replaced skull geometry as the indicator of altruistic potential for self-deception and goodthinkfulness. Thanks.